Recently, explosive scientific evidence proving that high-tech nano-thermitic material was present in the World Trade Center dust was reported in a scientific journal titled, "Active Thermitic Material Discovered in Dust from the 9/11 World Trade Center Catastrophe." Authored by an international team of physicists and chemists, the article in the Open Chemical Physics Journal 2009, Vol. 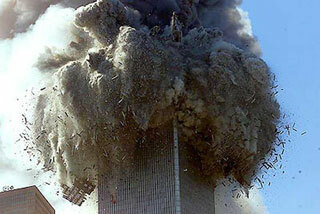 2, said, "We conclude that the red layer of the red/gray chips we have discovered in the WTC dust is active, unreacted thermitic material, incorporating nanotechnology, and is a highly energetic pyrotechnic or explosive material." The Young Turks with short entry about "Active Thermitic Material..."
The comments as always divided between "Non Believers" posting nonsense and denial and rational, educated Truthers. Besides that, the silence is deafening. The story does't got legs so far, and that means that the mainstream media is full of fear about this. How can we break loose the story? PETER'S NEW YORK, April 4, 2009--A group of researchers says it has positively identified residues of undetonated explosives in dust samples collected soon after the collapses of three World Trade Center buildings on September 11, 2001. The positive outcome of tests carried out in painstaking detail appears to contradict the assertions by U.S. government experts that explosives were not used to take the buildings down. February 13th, 2009, 7:00pm at the Tattered Cover Book Store in Lower Downtown Denver (LoDo) Richard Gage, AIA founder of Architects and Engineers for 9/11 Truth will be discussing the destruction of the World Trade Center through a multimedia presentation that promises to be suitable for professionals and laymen alike. That’s right, Friday the 13th Denver’s skeptical are encouraged to join Richard Gage for some solid, documented evidence and disciplined thinking. Highlights will be archived here after the broadcast. PETER'S NEW YORK, Nov. 19, 2008--One of the major critics of the U.S. government's version of the events of September 11, 2001 is calling for the formation of a “truth and reconciliation commission” to get to the bottom of the happenings of that day.